Only 8 sleeps till the big guy comes! Are you ready? I feel like everyone keeps asking that on social media and honestly, I’m usually not completely done until a day or two before Christmas Eve. Frank and I just went through the list of all of our family members and friends that we need gifts for and realized we still need to do a good amount of shopping for the boys! Its hard because they already have so many toys and Luke’s birthday is January 2nd. Last year the amount of gifts he received was so overwhelming that we’re trying to think of an alternative this year. One thought was to save half of his presents for a little half birthday celebration in the summer. I would love suggestions if anyone is in a similar situation with a holiday birthday! I love these gold loafers! They’re a perfect touch of gold and they don’t feel overly holiday that you wouldn’t want to wear them past December. I have this thing for clip-on earrings. it reminds me of my Belgian Grandmother. These are gorgeous. If you’re looking for a fun pair of holiday earrings and are on a budget, THIS under $50 oversized pair is so pretty! 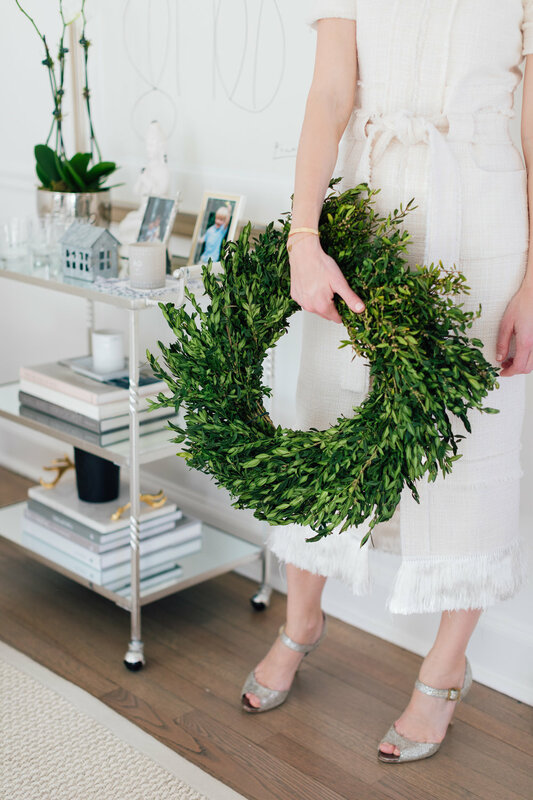 Posted on December 17, 2018 by Stephanie Trotta and tagged holiday home jimmy Choo mary Jane sparkle glitter heel Alexis ivory fringe belted dress bar cart picasso print franchise head of a woman holiday decor boxwood wreath.